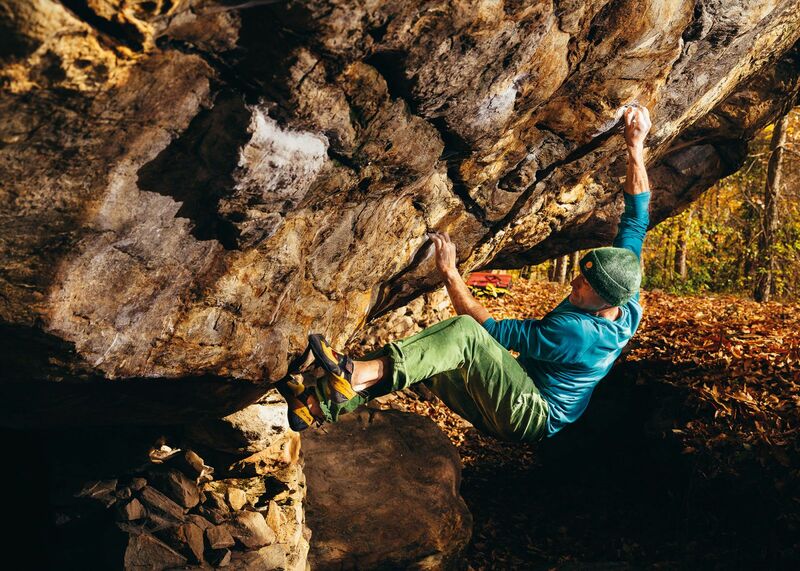 Bouldering has always existed and with it, its characters and days to remember. Pierre Alain, for example, started to visit the boulders of Fontainebleau during the 20s, and he was also one of the first to believe in using soft shoes: on the smeary sandstone stiff boots were not of much use. In the United States, around the 50s and 60s, John Gill made the most of his background as a gymnast introducing the use of chalk to climbing. Just like skateboarding was invented by bored surfers when the sea was flat, or climbers who used the boulders at the bottom of the valley to train while it was bad weather or to play around during evenings which were based on bonfires and hallucinogens. Very few though, would give bouldering its own dignity: it will take a few years before it is emancipated. In skateboarding it happened thanks to the Z-Boys of Venice Beach, a group of charismatic and subversive surfers, who were able to break the rules thanks to their performances and to come out into the open on the media channels of that time. Bouldering in Italy experienced a similar story and in a few years the revolution which took place as a result helped develop indoor gyms, meets and above all a new movement, in which climbing as an activity had become a chance to socially spend time together. I got one of the main characters who experienced and took part in it to tell me all about it, by spending an afternoon with Marzio Nardi at the bar of the Bside climbing gym, which is a bit like going to your grandfather’s house and listening to his life story. Le Bronx 8c+, Macumba Club 8c and La Connexion 8c. Just to get an idea, the natural holds on Le Bronx 8c+ are three out of thirty: the cutting edge consists in chipping increasingly small holds on increasingly steeper overhangs instead of looking for a climbable line amidst the sea of rock. Then just like the bored surfers of California, we have the rebels: one of these is Fred Nicole, who after abandoning the world of competitions in 1994, started traveling and looking for erratic boulders, and not rock faces. Before, the people who dedicated their time only to bouldering, were usually confined geographically (at Fontainebleau for example) because they could not reach other climbable terrain, but with Fred Nicole there is a precise search for that specific kind of climbing, discovering areas such as Rockland in South Africa. The fact that people would cover thousands of kilometres consequently legitimizes bouldering, giving it its own dignity and its own independence as an activity with an end in itself. Simultaneously, the first indoor gyms start to pop up where it is possible to train specifically and then perform on a terrain which is almost unexplored. In 1995 in Italy Marzio Nardi and Luca Giammarco establish Bside in Turin, an indoor gym which a few years later is followed by the opening of a climbing gym in Rome by Jolly Lamberti. Straight away these gyms bring together future boulderers, and above all, climbing on rock and on plastic start to work in symbiosis like communicating blood vessels, drawing climbers from one another and consequently with it exchanging new ideas and points of views. Another distinctive feature is how the climbing is done on the plastic of gyms: the route setting aims to recreate movements inside which can be found outdoors, instead of aspiring only to increasing strength and endurance with sequences repeated to the point of exhaustion. At the same time, the social phenomena based on having fun and meeting up is beginning to assert itself: you go to the gym to train but also to meet other passionate climbers with whom to go climbing during the weekend, searching for boulders to clean and climb amongst noise and barbecues, when up to a few years ago going climbing was synonymous with a life full of sacrifice and senseless diets with very few friends, rigorously in pairs to make the most of the time available. At the beginning, Marzio Nardi, recounts, the fun compared to climbing in crags which were visible from the roads, consisted in looking for new lines, and for boulderers this was a bit like looking for mushrooms, searching for hidden boulders in amongst the vegetation. At the same time, inspired by the reports published by charismatic figures such as Fred Nicole and Klem Loscot, Marzio and his friends started moving around looking to find harder moves, often undertaking long and tragi-comic journeys of hope: by car with Alberto Gnerro and Cristian Brenna towards Switzerland, but above all, the getaways by night train on Fridays from Turin to Fontainebleau. In those days, due to the physical absence of means of communication (except from reports on old and worn out newspapers), due to the different mentality, adventure was just beyond your front door. And it was the newspapers themselves that instigate the activity, treating it as the key player and not simply as an activity for bored alpinists to fall back on during a rainy day. One of the leading characters was Andrea Gallo who in 1999 convinced Vivalda, the publishing house of Alp magazine, to publish a special edition centred on freeriding, on those activities which deviate from the normal branches of alpinism and which were gradually spreading even at the top level: dry-tooling, off- piste skiing and above all, bouldering. The indoor gyms offer the chance to meet periodically thanks to competitions with auto certification, anyone can take part in these comps. Ideas develop until 1999 when at Triora the very strong boulderer from Liguria, Cristian Core, organizes the first official bouldering meet in Italy, and about fifty people take part. The initiative is so successful, even if it was only for a few close friends, that on the crest of this wave of enthusiasm Marzio Nardi and Alberto Gnerro organize another one only a few months later. This time the area chosen is Cubo, in the lower part of Val d’Aoste. What seemed to be simply a fashionable trend begins to break away from the earlier kind of sports climbing with its idea of putting on a show; if in 1986 at Sportroccia climbing enthusiasts came to watch the top climbers perform, at meets the event was created by the same participants who came to climb together, instead of spending their day with their noses in the air. The difference that exists between watching a football match sitting in a stadium or a stage of the Tour de France on top of the road after reaching it on your own bike. The choice of the Cubo is not a coincidence: here the partnership Nardi-Gnerro came periodically to test themselves, after Alberto discovered an enormous quantity of boulders when he came for walks here with his mum and their dog. For this area a difficult grading system was calculated, because, due to the scarce communication, there were no reference points with other realities. The grade 8a represented Colonne d’Ercole, something insurmountable, so much so that the two graded the boulder Materiale Resistente 7c, ignoring the fact that in other areas it would have been graded a lot higher. In 2004 the finishing line is fixed - and at the same time the starting line - of meets: Melloblocco is born, destined to become the most popular event in the world dedicated to rock climbing. As well as indoor climbing gyms, the other key player in the emancipation of bouldering was the introduction of the crash-pad. Before the ‘90s the preferred terrain was in forests where the boulders leant directly onto a layer of dirt and grass (just like the meadows in Val di Mello) and when a soft landing was not allowed cushions were stolen from old sofas in the homes of their grandparents. At Hueco Tanks the Americans had the habit of using proper mattresses taken from beds. The introduction of the first crash-pad which was studied specifically for bouldering, exponentially spread the practice of this activity without resorting to a monthly visit to the orthopaedic doctor. Or, looking at it in another way, you could break your ankle falling from higher up instead of lower down as previously. Ballerina shoes started to be used more and more, they responded better to the continuous need of putting on and taking off your shoes which was required by bouldering. The structure of the shoes, which was reduced to a bare minimum, used an elastic band or Velcro to lace up the shoe: Cobra and Skwama represented the evolution of a bouldering shoe very well. That is how, a bit at a time the movement found its own identity: technical equipment now exists, as well as a coherence in its ideology among indoor gyms and climbing meets. Even Italy starts to do things seriously, or at least it tries to. In 1998 Marzio starts the ball rolling by breaking the mental barrier of 8a with Icaro, on the hills just before Val di Susa which had held Sportroccia twelve years earlier. 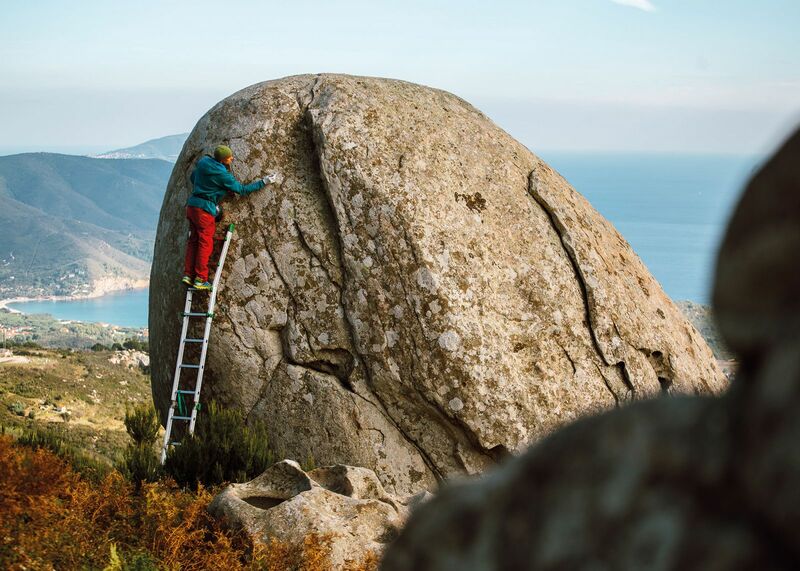 In 2004 the Herculean Mauro Calibani consecrates the seriousness of the Italian movement by climbing the sloping holds of Tonino ’78 at Meschia, the area which he had developed literally outside his front door: for the first time ever the difficulty of 8c+ is proposed for a boulder move. What Calibani defines as the New Bouldering Generation is born in ten or so years from nothing. It is developed by those bored climbers who looking for inspiration and areas to climb find refuge in the guide books of Giampiero Grassi and in the hand-written notes written by the Val di Mello boulderers. However, what happened at the start of the year 2000 cannot be defined as an explosion of bouldering or climbing says Marzio. A gradual growth. But the true boom is actually occurring just now, especially indoors. The increased media exposure, also due to the fact that it is now a brand new Olympic discipline is making it possible for the collective imagination to consider a figure hanging off a rock with hands covered in chalk on equal terms with a cyclist or skier. And more and more future followers of grazed finger tips and tight shoes will approach the discipline thanks to indoor gyms, the same areas where only strong climbers used to go to be even stronger on rock. The same elements which contributed to the appreciation of bouldering twenty years ago are the same today which feed its explosion: meets and indoor comps. Both activities allow anyone who has the minimum technical ability to take part in that movement. Because you can say: I took part in the Melloblocco and not I went to see the Melloblocco. Ondra climbed on those boulders, but everyone else was also there and each participant can say it with a hint of pride. «In man the need to climb upwards is a lot stronger than the will to descend», Marzio tells me provoking me, knowing how much I neglect climbing during winter in favour of ski-mountaineering. Inadvertently, man from when he is young, feels the need to climb higher, from when he starts to walk to shortly afterwards trying to climb up the first hill or the first nearby tree. And what about the future? It’s difficult to talk about the future with Marzio, who seems to enjoy the present moment one hundred percent, unconcerned with the years passing by. To give you an idea, he spent last summer fixing a cement pool for skateboarding, together with his children’s friends, who, could also be his own. According to him, in the future bouldering on rock and indoors will see two separate growths. The problem is the loss of impulse which hits new recruits who start indoors, and who often lack the ideal motivation to go climbing outside, outdoors. With a touch of regret, Marzio helps me notice how many new kids who climb indoors hardly go outside anymore to look for boulders or want to clean them, thus losing the best part of the game. At the same tame the modern temples of bouldering continue to call climbers in pilgrimage thanks to the same appeal which existed twenty years ago and which motivated him and other neo-boulderers to explore and find out: Magic Wood in Switzerland, each summer fills up with climbers thanks to the same reasons that in 1999 at Triora fifty messy kids met up with the same desire to feel part of something: climbing on great rock and having fun together. Together with other areas such as Albarracin, Magic Wood acts as a meeting point for many small movements which together are moving outdoor climbing forwards, in spite of the impulse lost during the years of discovering and cleaning new areas. «To tell you the truth, I doubt that during the next few years we will be queuing up to climb on a boulder. While now they are already doing it underneath a problem in the gym». It’s true: Bside, like all other large indoor gyms, has become increasingly crowded during the last few years. And not thanks to climbers who come to hang off holds and inflame their elbows on the campus board, but instead it is due to amateurs who first of all look for a meeting point to spend time together after work or university. From this observation Marzio gives his judgement on what will be the future of gyms, starting off from his personal experience. Guys like him who manage gyms will have to reason more and more from a business point of view, trying to give users an offer which includes services more complete for what is becoming a variant of climbing with a tendency towards fitness. This may disappoint purists but if boulderers do not take it upon themselves to do so, they will find themselves always less and less in this modern variant of how they consider climbing, then it will be done by somebody else. In the future it will not be so difficult to see a campus board with holds inside the same room as a cyclette or a tapis roulant: victim of itself, indoor climbing has to pay for the fact that it has become a mainstream activity. There will always be room for day dreamers: it will be possible everywhere and anywhere to discover boulders or scrub off moss from boulders together with friends. And even in cities, pirates will have the chance to row upstream and to be alternative: Marzio helps me observe how, in a few years, infrastructures might pop up ready to welcome metropolitan sports which will become a hybrid and overlap with each other. Large hangars which as well as big bouldering structures can hold skateboard ramps or elastic parcours carpets. Beneath it all, the visionary soul and a revolutionary nature cannot be changed. That stays for ever, even after twenty years.